Paterson’s Great Falls is one of New Jersey’s most significant untapped natural and cultural resources, and it presents the city with an opportunity to create a sustainable base for recreation, tourism, and economic development. The Great Falls’ designation in 2009 as a National Historical Park has sparked new potential for revitalization through redevelopment and heritage tourism. Entire sections of Paterson’s local street network were removed during the mid-20th-century construction of Interstate 80 and New Jersey Route 19. After public opposition cancelled plans for the full alignment of the highway through the Great Falls Historic District, traffic began making its way along Spruce Street, marring the historic landscape with congestion and rush hour gridlock. Currently, the poor condition of the sidewalks and related infrastructure poses challenges for pedestrians in a community with thousands of children walking to school and a high percentage of zero-car households. 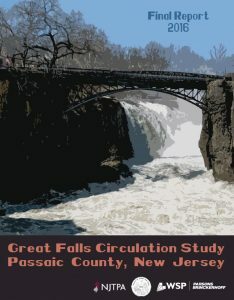 The Great Falls Circulation Study advances a vision plan centered on making the Great Falls Historic District and the City of Paterson a more welcoming and attractive place for education, tourism and economic development. 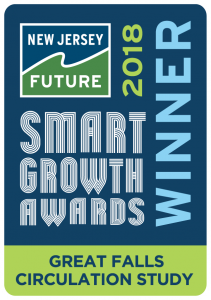 The study draws on the goals of the Transportation Element of the Passaic County Master Plan (a 2013 Smart Growth Award winner). These goals included supporting economic growth, sustainability, and diverse mobility needs through complete streets, green infrastructure, public transportation, and integration with previous plans and resources. The study advances a five-part Gateway Vision plan of multimodal and placemaking investments that support the local community and surrounding land uses while elevating this crucial historical and cultural asset to spur new investment. An extensive stakeholder outreach process used focus groups and public forums to gather perspectives not always apparent in demographic analysis. Local residents, business owners, and nonprofits provided input on how various kinds of investments could affect their neighborhoods. Using state-of-the-art data collection and traffic modeling, the study team created an analysis tool that illustrated the mobility demands and impacts of gateway alternatives. Guided by a vision that would elevate the historic, cultural, and community assets, the recommendations provide a framework for comprehensive and achievable implementation goals. In 2016, the Passaic County Board of Chosen Freeholders adopted the study as its guiding document for transportation and infrastructure investments in the area. Implementation of the study’s findings has already led to advancement of the Gateway Vision Plan. 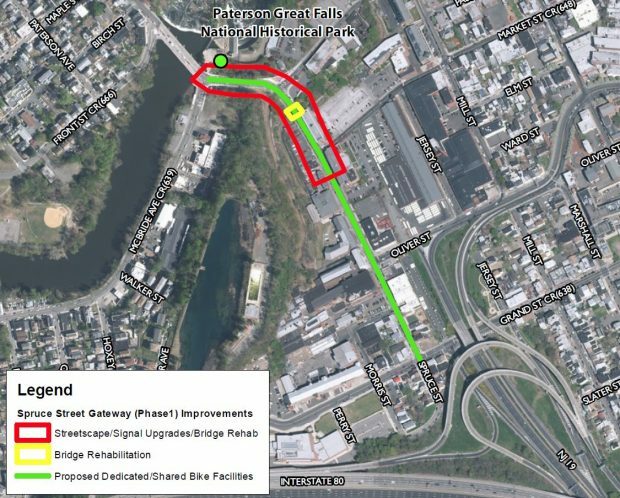 Detailed traffic modeling and alternative solutions led to a redesign of the Spruce Street Bridge over the Passaic River, from a four-lane bridge with limited pedestrian amenities to a three-lane configuration that more than doubled pedestrian walkways and reinforced safe pedestrian crossings and slower vehicular speeds. It also included historic architectural elements inspired by the design of the original 1930s-era bridge, which were lost during the bridge’s replacement in the 1980s. 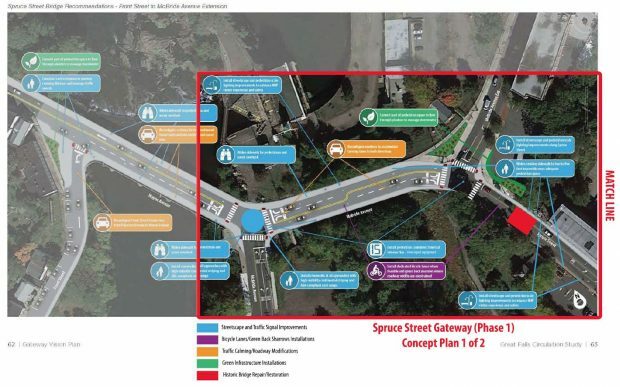 Passaic County secured more than $1 million to construct the first gateway elements that would connect the redesigned Spruce Street Bridge to Market Street. 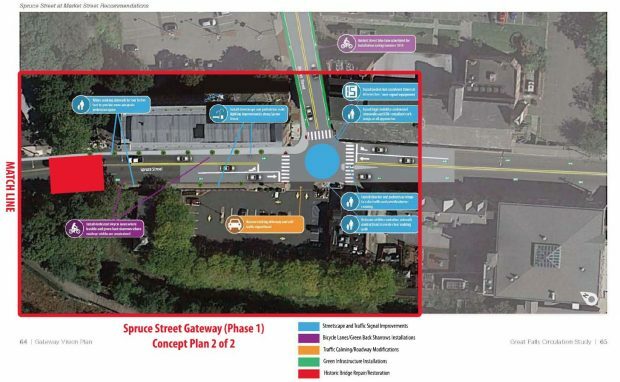 The Transportation Alternatives Grant will set the design language for the remainder of the Spruce Street Gateway, including widened sidewalks, pedestrian-scale lighting, street trees, and enhanced traffic signals. Curb extensions featuring green infrastructure will provide a new functional design element that create a more resilient and natural neighborhood. The process of developing the study created the framework for ongoing coordination during the engineering phases of these projects and submissions for new funding opportunities. The vision has also served private property owners, who helped shape its goals and who will be able to capitalize on place-based investments in the district’s historic buildings. Ultimately, planners envision a welcoming boulevard where pedestrians and cyclists can travel safely to school and downtown destinations. It will provide better access to public transit, community resources, and the National Historic Park. Community-driven goals focused on implementation are transforming that vision into reality. The momentum from this project will contribute to Paterson’s ongoing revitalization.